LES DAMON & CLAUDIA MORGAN WERE RADIO'S NICK & NORA CHARLES IN THE THIN MAN. THE SIMILARITY OF NETWORK RADIO'S two popular mystery-comedies involving married couples turned amateur detectives is striking. Yet, Nick & Nora Charles of The Adventures of The Thin Man and Jerry & Pam North, (aka Mr, & Mrs. North), each went their casual way of stumbling over murders and solving them on a weekly basis that led to both becoming Top 50 successes for four concurrent seasons in the 1940‘s. Their story in text and sound is Gold Time Radio’s latest post, Married Sleuths. ​THIS WEEK IN THE GOLDEN AGE reaches the end of another month and the beginnings of several Network Radio legends. The April events listed below are just a handful of the 763 listed for the month in GOld Time Radio's chronology, April in The Golden Age. (Actually, one of the biggest stories in radio news history and noted on the site, happened before the Golden Age on April 21, 1930. Check it out.) Meanwhile, guess the exact years the following took place and check your answers with April In The Golden Age. April 22, 195_: An estimated five million American television viewers witness the Yucca Flat, Nevada, atomic test from a camera atop 9,000 foot Mt. Charleston 40 miles away and remote facilities provided by KTLA(TV)/Los Angeles. April 26, 195_: Classic western drama Gunsmoke begins its ten season run on CBS starring veteran radio actor William Conrad. April 29, 193_: Carleton E. Morse’s serial One Man’s Family, originating in San Francisco, begins as a Friday night half hour on the NBC Orange, (West Coast), Network. April 30, 194_: WENR/Chicago newscaster Paul Harvey, 30, debuts on ABC with a Saturday morning 15-minute commentary, The Pulse of The News..
NO ONE IN BROADCAST JOURNALISM could match the records of H.V. Kaltenborn. He was a Phi Beta Kappa who didn’t enter Harvard until he was 27. His peers dubbed him The Dean of Radio Commentators, but he was 43 before his first broadcast. He was the first newsman on radio and the first to editorialize, (WJZ,1922). He was the first analyst to get kicked off a station for his comments, (WRC,1923). He was the first news commentator in Network Radio, (CBS,1927). He was the first American correspondent to interview Adolph Hitler and Benito Mussolini, (1932). He was the first newscaster to broadcast from the middle of a war zone during a battle, (Spain,1937). What made Kaltenborn’s broadcast career truly unique is that in over 30 years and thousands of appearances on the air, he never read from a script. His broadcasts were completely extemporaneous, dependent only on notes and memory. This should be kept in mind when listening to his well organized commentaries like millions of Americans did during the tumultuous days before and during World War II, when his 15 minute weeknight broadcasts were in the Top 50 of all programs five times. It’s the colorful story of an American original who made Network Radio history, H. V. Kaltenborn. WE'VE SAID MORE THAN ONCE that Network Radio's Golden Age of 21 years resulted in over a Billion dollars in revenue. And more times than once that statement has been challenged. So, we set out to prove it - two years ago. It's taken that long to ferret out all the numbers that went into 21 years of gross revenues for the networks. (Thanks to Variety for splitting those lump sums that NBC issued combining NBC's Red and Blue Network billings.) The result is our lengthy post, ​The Gold In The Golden Age. The post traces the gross revenues of each network for the 21 years of the Golden Age beginning in 1932, plus the affiliate growth of each chain, plus the station and billings record of the entire Radio Industry during the era. Did the networks ever pass that Billion dollar mark? Yup. The Gold In The Golden Age tells you when. But GOld Time Radio's lengthy post only told part of the story. So, we added figures from 1927 to 1931 chart the network's early and rapid growth in revenues, and 1953 to 1955 to illustrate its demise fade when television overtook it. We call this second set of figures, Radio Nets' Grosses. Just for good measure, we've tracked the gross revenue growth of Network Television from 1948 through 1955 - a short span of years in which the video chains became a Billion dollar industry. It's a wealth of information about the wealth in radio and television networking: Radio Nets' Grosses. ONE OF THE BEST RADIO SERIES FOR MUSIC produced in America in the 1940's was never heard in the continental United States. It was the weekly half hour of performances by mostly black jazz artists called Jubilee - recorded first for the Special Services Division of The War Department and then by the Armed Forces Radio Service from 1942 until 1948. Duke Ellington, Count Basie, Fletcher Henderson, Benny Carter, a Who's Who of top bands, appeared on ​Jubilee frequently, along with vocalists Lena Horne, Nat King Cole, Thelma Carpenter and Billy Eckstine. GOld Time Radio is pleased to present the story of this historic series and sample episodes from its earliest days and from its prime when it was hosted by a little known black character actor, Ernie (Bubbles) Whitman, who epitomized the jive-talking hipsters of the era. His contributions to Jubilee helped make the shows memorable and the music is great as our post proves. HANDSOME KARL SWENSON HEARD the expression, "You oughtta be in pictures!" more than once. But instead of pursuing a film career, the versatile "man of many voices" stayed in his native New York City and became Network Radio’s busiest character actor, starring in two soap operas every weekday for nearly 20 years and appearing in scores of nighttime dramas. Then, when he finally made the move to Hollywood in the mid-fifties, Swenson became one of the most active supporting actors in the industry, seen in over 200 episodes of popular television series. GOld Time Radio traces the career of this often overlooked multi-media personality in its post, Karl Swenson, and explains the why he became so popular with producers and directors. To illustrate that point, we add a collection of radio shows in which his talents, (and various dialects), were employed. You’ll agree, he was begavad. CROSS-OWNERSHIP AND CROSS-PROMOTION between radio and movies began before the networks existed and films talked. Before Network Radio’s Golden Age ended in 1953, two networks had been related to movie studios, (NBC with RKO and CBS with Paramount), two filmmakers owned major market stations and most of the studios climbed on the 15 year bandwagon from 1935 to 1950 when theaters were flooded with movies based on popular radio shows and personalities. Many of the details of this relationship are covered in Gold Time Radio’s post, Radio Goes To The Movies. It was a complex, win-win situation involving millions for all concerned regardless of the level where it existed. It began in the 1920’s and lasted until television struck near-mortal blows to both industries. It’s related over half a century later in Radio Goes To The Movies. W.C. FIELDS DIED IN 1946, yet audiences still laugh at his antics today. His insult bearing exchanges with ventriloquist Edgar Bergen’s Charlie McCarthy are the stuff of Network Radio legend although most of them took place within the span of just a few months in 1937. GOld Time Radio presents a half dozen episodes of NBC’s Chase & Sanborn Hour containing those exchanges in our post, W.C. Fields. CHICAGO RADIO LISTENERS WERE SURPRISED when they tuned to WENR shortly before midnight on January 1, 1934. Instead of the dance music they expected, they heard a sudden, loud gong then a soft, sinister voice ordering, "Lights Out… evv-erybody,” and a slow series of 13 beats struck on a chime combined with the increasingly loud sounds of a howling wind. They heard the first broadcast of Lights Out! - the pioneering, often shocking program of macabre and horrifying stories in the post-midnight hours on WENR and later on NBC. Gold Time Radio traces its history in text and sounds at the post, Lights Out! Just remember this warning that preceded many of its episodes: "Lights Out stories are not for timid souls. We tell you calmly and very sincerely, if you frighten easily, turn off your radio...now." AS THE THREAT OF WORLD WAR II neared in 1941, the four national radio networks planned to celebrate the 150th anniversary of the ten original amendments to the Constitution - The Bill of Rights - with an industry-wide broadcast explaining their importance to America’s freedoms in simple terms. That was no easy task because the ten amendments encompassed 25 separate rights and privileges, (five in the First Amendment alone). The U.S. Office of Education recruited Norman Corwin for the job which he turned into a masterpiece, We Hold These Truths. Narrated by Jimmy Stewart and featuring a dozen top Hollywood stars, it was broadcast at 10:00 p.m. on December 15, 1941. GOld Time Radio tells the story of the program and how it relates to the original significance of December 7th to the United States - a monumental event often lost in the smoke and carnage of Pearl Harbor. The smoke is cleared with a bonus broadcast from 1937 at GOld Time Radio’s post, We Hold These Truths. FRANK MORGAN WAS ONE OF AMERICA'S busiest character actors of the 1930’s and ‘40’s. He had 81 feature films to his credit over the two decades. In addition he was a star for ten Network Radio seasons with four finishes in the Annual Top Ten. Yet, busy as he was, the jovial Morgan was known to enjoy a nip or two during his long workdays, often carrying a brief case well-stocked with flasks and a supply of Angostura bitters, indispensable for Manhattan and Old Fashioned cocktails, and for his family’s fortune. Details of this little known story and many more are found in GOld Time Radio’s post, Frank Morgan. WHEN IT DEBUTED ON CBS IN 1931 The March of Time was an immediate hit with a listening audience that was hungry for news from radio. The unique half-hour dramatized the week's top news stories found in Time magazine and produced them with accurate professionalism demanded by the publication and the network which both staked their young reputations on its credibility. They were rewarded by audience acceptance that led to four consecutive years in the Annual Top 50. Then a move was made that spoiled it all. That downfall, the program's resurrection to two more seasons in the Top 30 and then the second blow it suffered in 1944 which proved fatal, is all reported on our new post, The March of Time. You'll also hear some examples of this fine program which include Westbrook Van Voorhis's familiar and commanding, " TIME...marches on!" It was good radio. ​​FATHER CHARLES E. COUGHLIN of Royal Oak, Michigan, began his Golden Hour of The Little Flower over 90 years ago WJR/Detroit. And so began the 14 year radio journey of the young pastor of a small congregation in a Detroit suburb that resulted in nationwide recognition and millions of dollars in donations at his peak, then condemnation as a Hitler-loving anti-Semite a short time later. As our post Father Couglin reports, the National Association of Broadcasters urged stations to cancel his weekly broadcasts in 1939. Father Coughlin isn't a story that fan magazines of the era gushed over. Instead it traces the power of the spoken word disguised as "gospel" amplified by the new medium of radio in a clash with the political realities of a nation in economic depression and on the verge of war. The post contains several addresses from the self-described "radio priest" which may leave the listener wondering, "Did he really say that?" He did. THE THOUSANDS OF MONTHLY VISITORS to GOld Time Radio all share some degree of interest in Network Radio's Golden Age. They also share some degree of knowledge of how that 21 year era in broadcasting history came about. Here's our contribution, taken in part from our book, Network Radio Ratings, 1932-1953. It's called Alchemists of The Air. This is an unusually long post and you'll find it differs from most historical accounts because it traces the inception and development of commercial Network Radio from the perspectives of all the contributing industries that shaped it. The reader may find a few surprises in that regard as we track the 90 year path of those who transformed thin air into gold, the Alchemists of The Air. MOST NEW SEASONS during Network Radio's Golden Age found one or more of listeners' favorite programs and personalities coming to them from new networks. It was a common practice as GOld Time Radio's post, Network Jumpers, illustrates. We found 40 examples of programs or personalities who moved between NBC, CBS, Blue/ABC and Mutual, often at the height of their popularity. To make it more interesting for you, our list is presented in the form of a quiz which asks you to identify the shows involved. (The answers are also provided.) Network Jumpers is another of GOld Time Radio's quizzes that have proved popular in the past - like Three Letter Calls, A Network Radio Quiz, Starting Points or any of our eight nightly, (Sunday through Saturday plus Multiple Run), All Time Top Ten posts. Enjoy - but be aware that you may learn something. We certainly did! DON'T DELAY! SEND FOR YOURS TODAY! That was the familiar command of Network Radio announcers introducing, "... the newest, the latest and the best ever," premium offered to young listeners of their late afternoon adventure serials. Little did the kids who rushed to send in their box tops and dimes know that the gadgets they ordered, (which often played a life-saving function in their serial's plot), didn't exist yet! Premium offers were often introduced on Fridays so sponsors could gauge their popularity from the first weekend's mail when ordering production runs which often ran into the six or seven digits. GOld Time Radio's post, Serials, Cereals & Premiums tells the story of why mail order premiums were first employed by radio advertisers and how they were used by sponsors of weekday juvenile serials to sell product - most notably breakfast cereals. The post also contains 21 episodes of nine popular kids' shows from Network Radio's Golden Age that contain commercials for premium offers - sometimes up to four minutes long! It's historic, hilarious and posted at Serials, Cereals & Premiums. THE THREE MEN MOST INFLUENTIAL in determining the fate of programs during the Golden Age didn't head a network, own radio stations or run a sponsoring company. The listening public never heard their voices and few knew of their existence, let alone their importance in the broadcasting industry. Yet, the semi-monthly audience measurements of Archibald M. Crossley, Claude E. Hooper and Arthur C. Nielsen became the standards by which almost all programs were judged. Our post, Radio's Rulers: Crossley, Hooper & Nielsen, tells the story of why audience polling began, how the results became known as ratings and how the three services eventually became one which still exists today. ​NETWORK RADIO'S GOLDEN AGE ended in June, 1953. This conclusion became obvious when examining the decline in audience ratings and network billings that peaked during the World War II years and fell sharply with the growth of television. Our post, The 1952-53 Season tells the story in no uncertain terms. ​OVER EIGHTY YEARS AGO NBC'S BLUE NETWORK gave Sunday afternoon radio listeners something to talk about all week long. It was new. It was unique. It showed off the mind-boggling capabilities of NBC and its parent, Radio Corporation of America, for all to hear. It was a called The Magic Key of RCA - a variety show to end all variety shows mixing the performances of world famous stars of classical and pop music, comedy, drama and commentary appearing live from locations all over the world. For example, its first show on September 29, 1935, contained cut-in's from Europe, Asia and even from RCA President David Sarnoff,on a ship in the middle of the Atlantic Ocean! GOld Time Radio is now in its eighth year of researching and reporting some of the lesser known facts about the people and programs of Network Radio’s Golden Age. 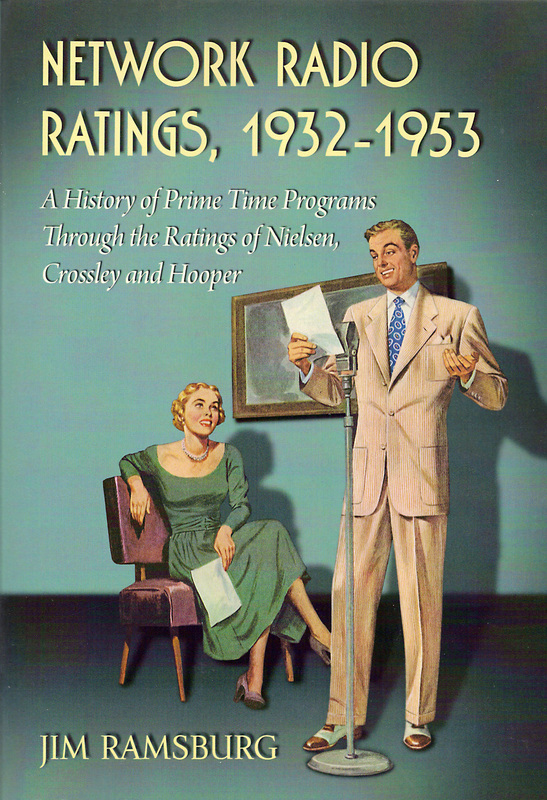 It began with the publication of my book Network Radio Ratings, 1932-1953, which defined the era in a time frame determined by ratings and revenue, and provided the first complete prime time audience ratings for all 21 years. The premise of the book and this site are summarized in my reading of the book's forward.